A drinks bar is a great way to jazz up any party’s décor. 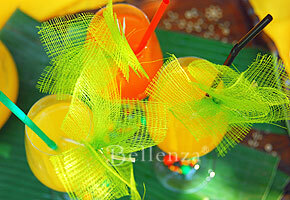 And what could be more fun than a drinks display inspired by the tropics? Its festive air and ease of preparation make it perfect for an engagement cocktail party right in your own home. You can have a blast putting together this table display, whether you’re hosting an intimate cocktail party, a seafood barbecue, a champagne brunch, or a wine and cheese gathering. Put your own personal spin on the look of the bar with colors and decor elements that coordinate with the theme, motif, or location of the event. Take a Look At Our Fabulous Tropical Drinks Bar Ideas! – Begin with a tablecloth in a colorful, tropical print. This pretty much sets the mood and is a no-hassle tactic. Add an equally bright solid-colored overlay, then fold, pleat, or scrunch up the fabric for a bit of flair. Specialty fabric stores often carry a variety of fabrics with prints, so this would be a good place to check out. – Set out a casual arrangement of tropical flowers (see photo a) such as birds of paradise and other vivid blooms such as cymbidium orchids. Stand them in a tall glass vase lined with multi-colored stones, colored acrylic beads, or sand…and voila, it’s done! – Use serving containers in different sizes and shapes to serve up multi-colored fruit punch. Fancy wine decanters in sleek or unusual forms (see photo b) are sure to raise the cool factor at this table. – Turn an ice bucket tropical (see photo c) as well. Wrap it with a small mat of woven straw strips (a bamboo placemat will do) held in place with a bandana in a cheery tropical print. – For more tropical touches: line wooden serving trays with banana leaves, and set out small shell trays to hold fruit garnishes and other drink accompaniments. – Serve your drinks in stylish stemmed goblets dressed in fun tropical “accessories”: multi-colored straws, cocktail umbrellas (see photo d), colorful glass-bead stem rings (see photo e), and swizzle sticks embellished with sinamay puffs (see photo f). – Garnish each glass with a slice of fresh pineapple, orange, or lime. And remember, it’s a tropical bar, so crushed ice is a must-have. – Be sure to use the right glass for the type of drink being served. Piña coladas, for instance, have proper “piña colada cocktail glasses” with a long stem and tapering bowl. – Spice up the party with a flavorful cocktail menu, featuring such exotic choices as crab Rangoon, chicken satay, calamari, breaded coconut shrimp, “sliders” (mini burgers), and prosciutto-wrapped melon wedges (see photo h). To accompany these savory selections, have dipping sauces on hand made from different kinds of fruits. Just keep in mind flavor, flavor, flavor! – Prepare a welcome sign that says, “This is our bar!” and display it in a classy abalone shell frame (see photo i). – To make all your guests happy—no matter their age—prepare a variety of alcoholic and non-alcoholic beverages. – Familiar tropical drinks such as strawberry daiquiris, mojitos, Waikiki beachcomber, mai tais, and margaritas are great. But why not also try exotic cocktails made with tropical fruits—such as passion fruit, mango, or guava? Chilled fruit punch made with any of these would be a surprising treat! – To view a sample menu, check out these recipes from the website of Oprah.com. – Still not too sure what to serve? Check out books for recipes such as “Tropical Cocktails Deck: 50 Sun-Kissed Drink Recipes” featuring a wide variety of drinks from tropitinis to fruity coolers. – For an example of a tropical cocktail, view this recipe of a Thai Mango Passion Cocktail from About.com. Stay Current with Our Drinks and Bar Carts Pinterest Board! Previous Beach-inspired Tablescapes To Make Your Summer Wedding Sizzle! Next Engagement Party Favors That Delight the Senses! These are great pictures and fantastic idea’s for summer backyard party’s! Hi Scott! So glad you like this set we created with a really hot summer theme. Thanks for stopping by! Thanks for hosting Marvelous Mondays, Paula! That was our first time to link up to your party…but it certainly won’t be the last.